Sterling utilizes two designs of its unparalleled spray valve for maximum dissolved gas removal, using the standard single cone for normal operation and the patented (U.S. Patent # 5,862,992) Dual Cone High Efficiency Spray Valve in difficult applications. The Sterling Spray Valve is cast from rugged, non-corrosive type 316L stainless steel to ensure maximum life. This self-adjusting spray valve can handle flow up to twice its rated capacity, while maintaining an effective, consistent spray pattern. Because the Sterling Spray Valve is hydraulically balanced and non-guided, solid particles and debris pass harmlessly through the valve without clogging or reducing performance. As described in the Deaerating Principle, the thin film of feedwater sprayed into the steam atmosphere provides rapid heat transfer and gas removal. The Sterling Spray Valve produces that essential thin cone of feedwater consistently over its operating range, resulting in continuous deaerating performance. Sterling’s Dual Cone Spray Valve adds a second, slightly smaller, cone of feedwater which produces a 71% increase in steam to water surface contact area within the deaerator’s spray zone. The Dual Cone Spray Valve is best suited for installation in existing deaerators to increase performance and reduce chemical costs. Upgrading is especially beneficial for customers with underperforming deaerators. The Dual Cone Spray Valve is a direct replacement for Sterling’s standard single cone design, as well as most of our competitors’ spray valves, making it ideal for retrofit applications. 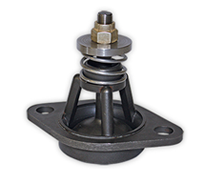 Sterling also offers mounting adaptors for conversion from some competitors’ older designs to the Dual Cone’s bolting pattern. In addition to Sterling’s superior spray valve, our tray type deaerators are also equipped with the Sterling Tray Assembly. 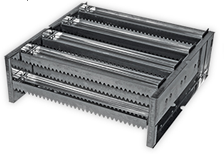 The Sterling Tray Assembly is constructed of 16 gauge, type 430 stainless steel and is fastened in one of two ways, with stainless steel rivets or sturdy interlocking stainless steel clips. 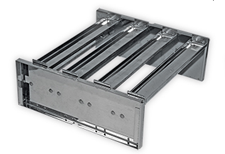 Each tray assembly consists of two staggered rows of four tray channels. 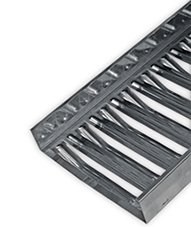 This staggered tray channel pattern ensures maximum feedwater retention and reduced pressure drop which results in optimum heating surface and deaeration. 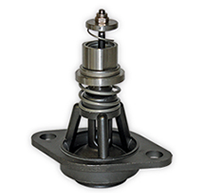 The Sterling Tray Assembly, as well as the Sterling Spray Valve, is designed to be resilient: able to withstand upset and extreme conditions resulting in reduced downtime. Rugged construction combined with lower steam pressure drop extends deaerator life even under the most severe operating conditions. 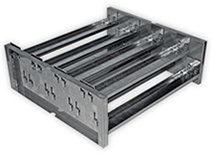 Sterling also offers trays for no longer existent companies, such as L.A. Water Treatment. Sterling can replace most competitors’ trays. We also offer a variety of manway gaskets to your size and specification. Field Service information available upon request.